Home » Blog » Birth Center in Morristown, New Jersey is Now Open! The Midwives of New Jersey are happy to announce the expansion of our service offerings to include births at “Our Birthing Center”, a birth center in Morristown, New Jersey that recently opened. Clients can now choose from a full complement of birth options. Hospital Birth in 2 Different New Jersey Hospitals: Morristown Medical Center and Hoboken University Medical Center. Both labor units are supportive of women’s choices in birth like eating and drinking, freedom of movement and water immersion. Both offer many supportive services following the birth such as massage and lactation help. Homebirth has been available for our clients since August 1st, 2008. 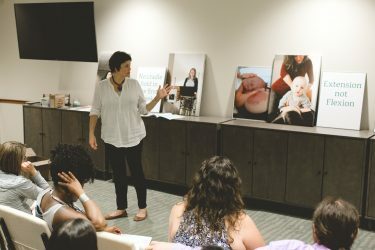 Homebirth isn’t for everyone but the families that choose it want to take responsibility for their birth experience and they want to be in the comfort of their own home. Water Immersion and Waterbirth is our specialty! We have been catching water babies since March 2000. In that time, we have become experts in facilitating labor and birth in a tub. We offer water immersion and birth in all of our birth settings. A study done by a Morristown hospital Obstetric Resident found that water immersion in that facility was linked to less forceps and vacuums, and lower cesarean rates than women who were never in a tub of water. Birth Center. There has been no birth center for more than 17 years in New Jersey. Our Birthing Center opened in January 2018 after the owners worked toward it for 5 years! We are thrilled to finally offer this final option for our clients and the women in New Jersey. Vaginal Birth After Cesarean (VBAC). The Midwives of New Jersey support a woman’s right to choose a Trial of Labor After Cesarean (TOLAC) and work side-by-side with our clients toward a safe, vaginal delivery. VBAC is very successful in our practice. In 2017, 70% of women attempting a VBAC had one. We believe that those choices will help to Improve Pregnancy and Birth Outcomes in New Jersey. Since our company’s inception, we have determinedly worked toward expansion of women’s right to CHOOSE where and how they give birth. We have marched in Trenton, held an Improving Birth rally in 2016 and host the New Jersey Symposium for Physiologic Birth. Our Midwives stand with our pregnant and laboring clients supporting their choices for their birth. For more information, email Midwives@midwivesofnj.com and register for a birth center informational meeting and tour.